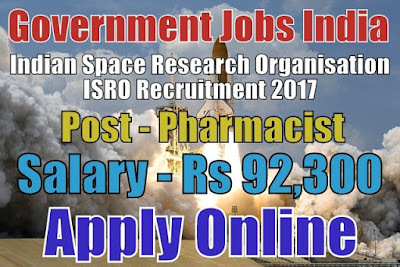 Indian Space Research Organisation ISRO Recruitment 2017-18 notification for 01 pharmacist post. All legible and interested candidates can apply on or before (15-12-2017). Further information about Indian Space Research Organisation recruitment entrance exam 2017, vacancies, salary details, isro exam date, application fee, educational qualifications and all other details/information about this post is mentioned in details below. Salary/Pay and Grade Pay - For pharmacist post, the payable salary will be Rs 29,200 - 92,300 per month. Further information about salary details is mentioned in the detailed advertisement. Age Limit - For Indian space research organisation recruitment, candidate age should be less than 35 years. Candidates having age more than thirty-five years cannot apply for this post. To know more about age details, click on the detailed advertisement. Educational Qualifications - Candidates have done 10th (matriculation), 12th/diploma in pharmacy or its equivalent/relevant/higher qualification from a recognized board or university. To know more about educational qualification details, see the advertisement. If you are not graduated then, click here for 10th and 12th based jobs.